Wow, that’s crazy that ROUTINE_DEFINITION only gets the first 4000 characters! Any idea as to why they would implement it so? 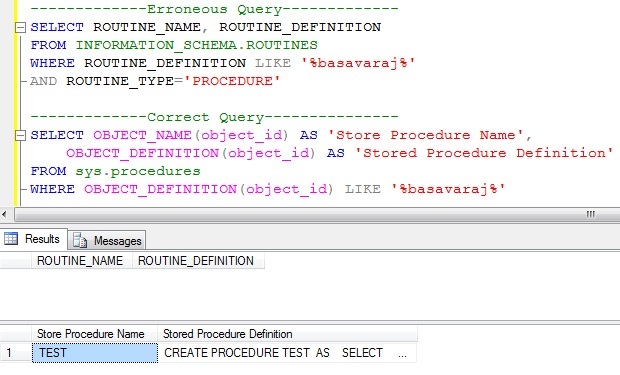 Pretty much everyone (including myself which I believe was one of your sources: http://devblog.grinn.net/2008/02/search-for-stored-procedure-containing.html) uses ROUTINE_DEFINITION to perform such a query, so this is a big find, Basavaraj! Do you know view sys.Sql_modules? Yes. We can use sys.Sql_modules as well. Brilliant find dude! I was beating my head against my monitor for an hour wondering why I couldn’t match a string in a long SP using ROUTINE_DEFINITION, but now I know! You rock! HI basavaRaj, how to listout all tables from any procedure, which are selected which are deleted which are updated like this. when I try to use sys.dm_sql_referenced_entities in ssms2008 system displays as “Invalid object name ‘sys.dm_sql_referenced_entities’.”,but in one article says “sys.dm_sql_referenced_entities” it is available from 2008 onwards.. It should work in Sql Server 2008. Just run the query SELECT @@VERSION to know the Sql Server version. Otherwise you can use SP_DEPENDS. I have run across the 4000 character limit also. I believe it just the way Enterprise Manager displays the results. The entire text of the object is there, just not displayed. This should show the entire text of the command. I was looking for this .. Were googling a lot and found your article. It really helps!!!! will check the site for new tips on my free time!! Great artical.thank you very much.I was looking for this. Bcz some times my one of storeprocedures is droping. i was unable to find which storeprocedures casuse to droping that storeprocedures. using this script i found that storeprocedures.thank you again. Thank you for the above queries. I need one more query which can fetch only the particular word in the stored procedure. If we query ROUTINE_DEFINITION like’ ‘_Injury’ , entire store procedure will be fetched which contains the word ‘_Injury’. I need to fetch the exact word which has ‘_Injury’. My stored procedure contains words like ‘Head_Injury’ ,’Hand_injury’ etc. I want only those words to fetched which concatenated with ‘_Injury’. Could anyone can help me on this? superb, thanks buddy for sharing this!